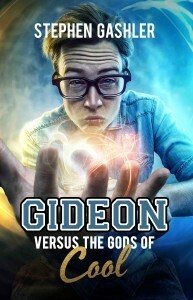 As I promised to fans at the LTUE Science Fiction and Fantasy Symposium last weekend, I’m giving away ebooks of my new Young Adult, Urban Fantasy novel, Gideon Versus the Gods of Cool, for free. I’m looking for beta readers to give feedback before it goes to the publisher. Please let me know what you think and, if you like it, leave a review on Amazon. Your reviews make a big difference in the success of the book. And any feedback you can send me, even if only about grammar errors, is appreciated. If you absolutely hate the book, let me know! This will help me gauge my audience, and I’ll graciously thank you for your time. But you only have until midnight tonight to download the eBook, so don’t snooze! Gideon Greenwich, a delinquent nerd, is given two choices: join the football team or be expelled. To be “initiated” into the team, Gideon attends a violent fraternity party, where he has a startling discovery: the jocks are being controlled by an evil god of sports! As the conspiracy unfolds, it appears that the entire school has been hijacked by otherworldly beings posing as teachers. To resist their dark powers, Gideon must look beyond social cliques and team up with star quarterback Doug Rock and the beautiful cheerleader Cynthia McDaniels. Together, the unlikely friends take on the god of sports, the goddess of fashion, and the god of popularity. But defying the “gods of cool” takes courage, a willingness to look stupid, and mind-bending adventures through paralell universes.